The Trump tweet heard round the world announcing the firing of the secretary of State vindicated reports leaked to the press last fall saying Rex Tillerson’s days were numbered. It also likely postponed further progress on his much-discussed but controversial plan to reorganize the State Department in ways that many employees—at least privately—resented. The reorganization plan was criticized as vague and formulaic, and was bedeviled by a shifting cast of characters leading the charge. Pickering said that he “didn’t find a plan” in what Tillerson called the “redesign.” The effort thus far has been “just a series of isolated steps dealing with minor questions within the department, none of which faced up to many of the longstanding and particularly challenging issues,” Pickering said. Amb. 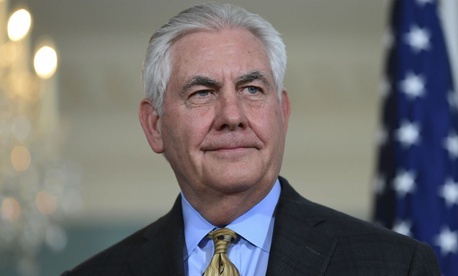 Ronald Neumann, president of the American Academy of Diplomacy, said Tillerson’s slow pace in filling positions had set the department back, citing an overloaded South Asia bureau with 24 percent of its civil service slots empty and a lack of posts for spouses that have become essential to recruiting for the modern diplomatic service. The other is the reorganization plan that in February’s Trump administration budget release was renamed the “Impact Initiative.” Neumann called it a “clunky, cumbersome process with a lot of employee input, none of which merits a year of pain.” But it also contained what his organization views as “good things” like the information technology modernization plan, the elimination of the secretary’s second deputy and the folding of special envoys into specialized bureaus. Sen. Ben Cardin, D-Md., the ranking member on the Foreign Relations Committee who has criticized the plan, told Government Executive on Tuesday that “Tillerson was a good soldier to the Trump administration, and he took the numbers they gave him and tried to make it work. He used the reorganization to get to the numbers [the Office of Management and Budget] had given him, but it wasn’t going well,” Cardin added, mentioning a “mass exodus” of career staff. Tillerson’s slow-motion rollout of what he called the “redesign” plan hit some bumps. Last November, Maliz Beams, his hand-picked guru with private-sector experience in changing organizations, departed after just three months on the job. Efforts by outside stakeholders to obtain internal planning documents were rebuffed by the secretive secretary. Tillerson deputy John Sullivan’s efforts last September to convince Congress that the reorganization was “bottom up” were met with skepticism about its rationale. In February’s budget release, State released more generalities and placed Daniel Smith, assistant secretary of the Bureau of Intelligence and Research, in charge. Tillerson said during a press briefing Tuesday afternoon that he was turning the reins over to Sullivan, but would remain on the job until March 31. The outgoing secretary praised his colleagues in the Foreign Service and civil service, noting, "We all took the same oath of office and remain steadfast here Washington and across the world" in supplying the talent that is acquired not in think tanks or lectures but on the "front lines." This story has been updated with comments from Tillerson's Tuesday afternoon press briefing, and from Sen. Ben Cardin, D-Md.